Written by Sandra Jurišić. 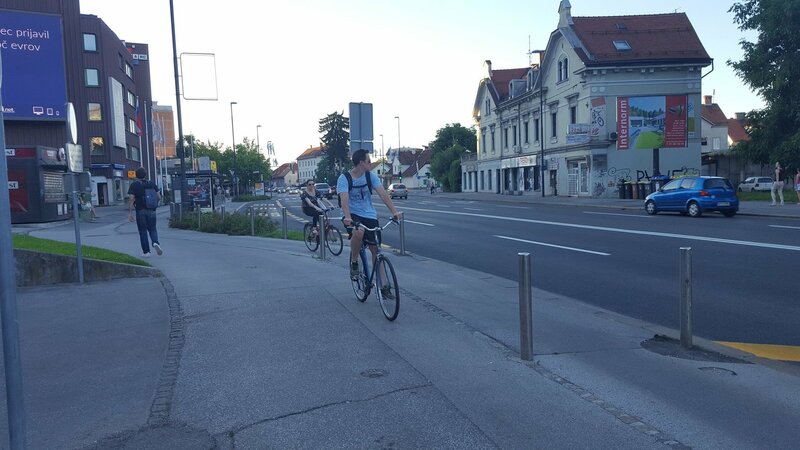 Cycling in Ljubljana can be an amazing experience – there are well-marked bike lanes everywhere, places to lock your bike strewn all around the city centre, and if you don’t have your own bike, it’s fairly easy to rent one (BicikeLJ). Biking is more comfortable than taking the bus, cheaper than a taxi, and apparently it’s also good for your health or something. It’s no wonder many locals opt for biking around town when the weather is nice (and the more courageous even when it isn’t), and visitors are more than welcome to join the swarms of cyclists taking over the city. However, there are rules to be followed and a delicate cycling etiquette to be observed, in order to make the experience safer and more pleasant for everyone involved. Here are a couple of dos and don’ts: DOS: - Do ride on the bike lanes and in the right direction; if there’s no bike lane, ride next to the right edge of the road, no more than a meter away from it. Basically, if you see a red strip on the road, that’s where you’re supposed to go. When in doubt, it’s probably best to get off your bike and continue on foot, just to make sure you’re not accidentally violating any laws. - Do respect the general traffic rules, as you are a part of traffic when you’re on your bike. This includes stopping at red lights, respecting the right of way, and using your hands to signal turns, among other things. You can’t forget that there are other people participating in the traffic with you and that you have to communicate your intentions to them. And remember, you’re bigger than a pedestrian, but smaller than a car. Adjust your attitude accordingly. - Do use lights if riding at night. These include a white light on the front of your bike, a red light on the back, a red reflector in the back, yellow or orange reflectors on your pedals, and yellow or orange reflectors on the wheels. Let’s be honest, you want to be as visible as possible in the middle of the night, and if that means shining like the beacon of Gondor, so be it. - Do make use of your bell. A bell is standard equipment for your bike, and it’s a good idea to have one. If there’s a cluster of pedestrians walking every which way in front of you, ringing your bell will warn them that you’re coming, and more often than not, they’ll scatter like frightened rabbits. If you don’t have a bell, but have exceptionally squeaky brakes, they’ll do too. DON’TS - Don’t ride on the major roads and sidewalks. The bike lanes are there for a reason, so use them. Sidewalks are for pedestrians, and riding on them, especially at a higher speed, can be an accident waiting to happen. Major roads are off limits, too, much like highways, as the traffic on them is too fast and you will be an obstruction to oncoming cars. Luckily, all the major roads in Ljubljana do have bike lanes adjacent, so that shouldn’t be a big problem for anyone. - Don’t take the whole lane for yourself. 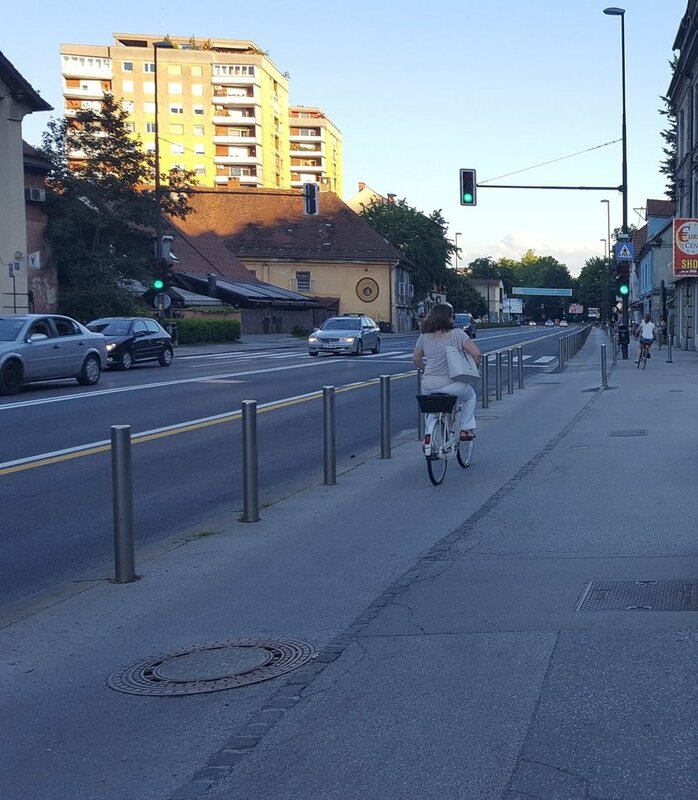 Some of the bike lanes in Ljubljana are a bit on the narrow side, and it’s easier to just ride in the middle of them. However, chances are there are cyclists behind you who are faster than you and will want to overtake you, which is nigh impossible if you’re riding smack in the middle of the lane. So stick to your right and let the others pass you on your left. Sure, at some point you might feel like you’re losing the Great Ljubljana Cycling Race, but it might be better to just let it go. - Don’t go too fast in areas full of pedestrians. This applies especially to the summer months, with lots and lots of tourists milling about, not really paying attention to what’s going on around them, and almost pointedly making sure to tread on the red bike lanes. It’s better to be safe than sorry in a situation like this, so go slowly. Ring your bell politely to try to get them off the bike lane. Grumble to your friends about mindless pedestrians afterwards. - Don’t ride drunk. This one is a big no-no, as the law says it’s not only illegal to ride your bike drunk, but even to attempt riding your bike drunk. Come to think of it, maybe I should have put this as the number one ‘don’t’. In any case, just don’t do it. You can and will be fined (if caught, of course). Opt for leaving your bike secured somewhere in the city and take public transportation to wherever it is you need to go. These are just some of your basic rules and regulations concerning cycling in Ljubljana and they apply in perfect conditions. However, traffic being what it is, conditions are never perfect, so be ready to improvise and adapt. Pedestrians will walk on the bike lane towards you, staring you down and not moving away, so be ready to banish all thoughts of them as bowling pins and you as the ball as you try to get around them. Cars will be parked right over the lane with all four blinkers on, and you’ll have to pass them while not thinking about how satisfying it’d be to break one of their lights, just a little bit. Don’t lose your temper, stay calm and keep going. 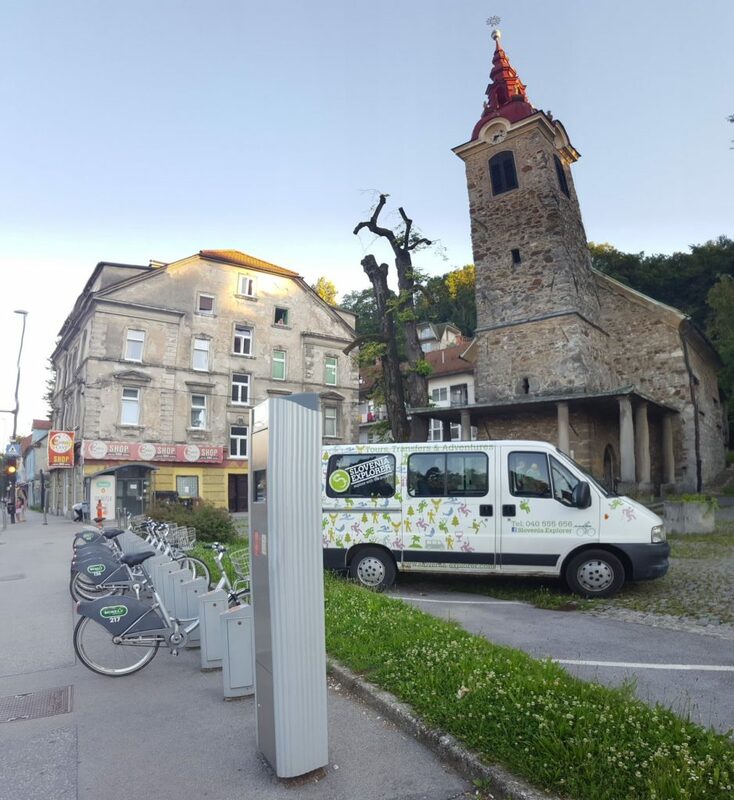 After all, biking is not only a great and cheap way to get around Ljubljana and see all the major sights, it can be incredibly fun as well and it’s a good way to get rid of all the extra calories you got from eating some of the wonderful Slovenian food. 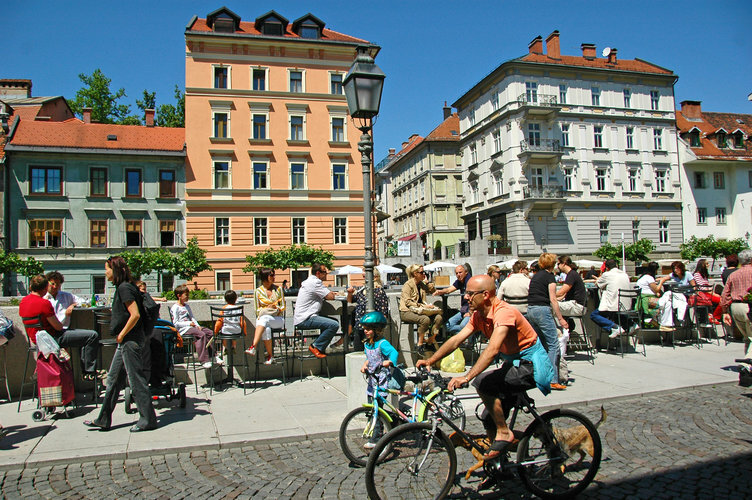 So hop on a bike and join the locals in making Ljubljana deserve the title of European green capital 2016. Tagged cycling, Ljubljana. Bookmark the permalink. Cycling in Ljubljana is really amazing experience. And this article experience also fantastic to read. I am very interested to visit Ljubljana ASAP. Hope I will cycling in this area near future.